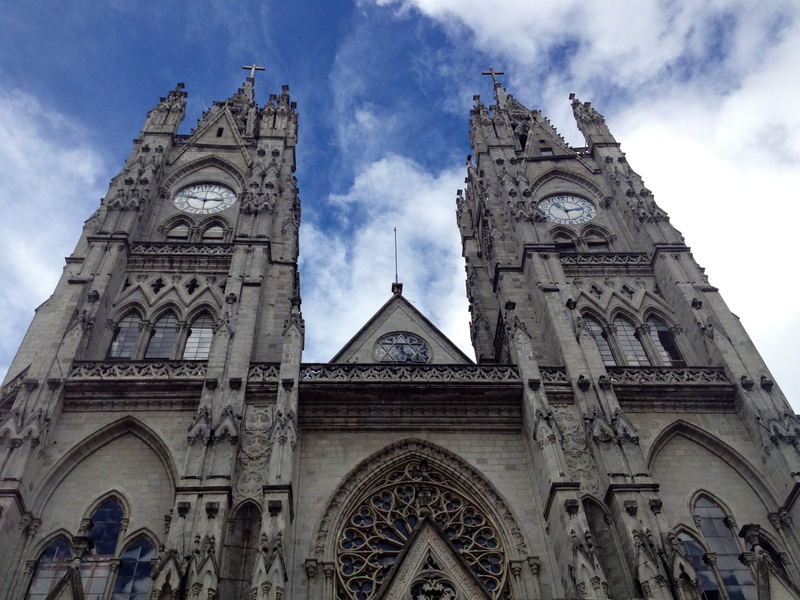 1.5 hours and $290 USD later, I arrived to Quito from Medellin, Colombia with Taca Airlines. The night before I left Colombia, I made arrangements to stay at Vibes Hostel in La Mariscal, which is an area also known as Gringolandia. 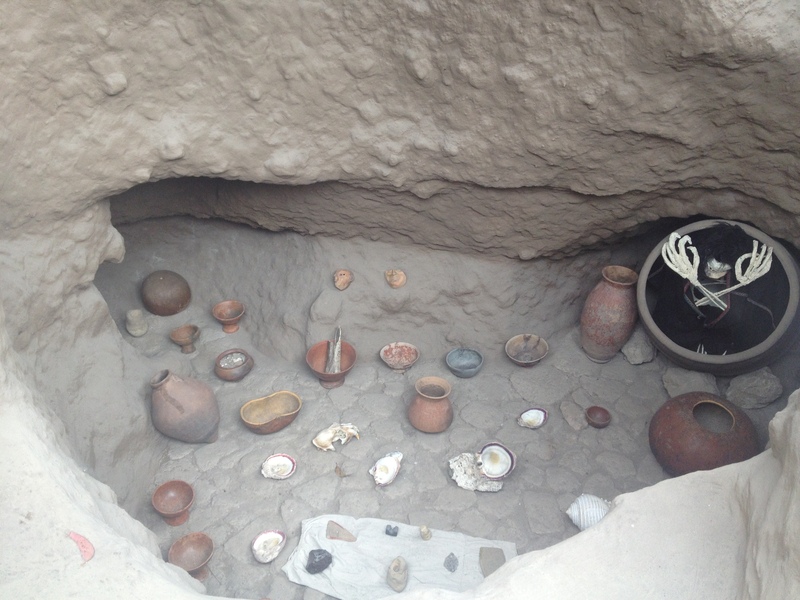 Its trendy bars and posh restaurants caters to both Quiteños and western tourists. You can party 24 hours near Plaza Foch, where tables and chairs spill into the streets busy with taxis trying to catch a fare. Santiago, the owner of the hostel was very accommodating and thankfully I didn’t come across any loud or disrespectful party people. There were a lot of bathrooms and showers and a good DVD collection to keep me happy during the 2 nights I stayed in Quito. 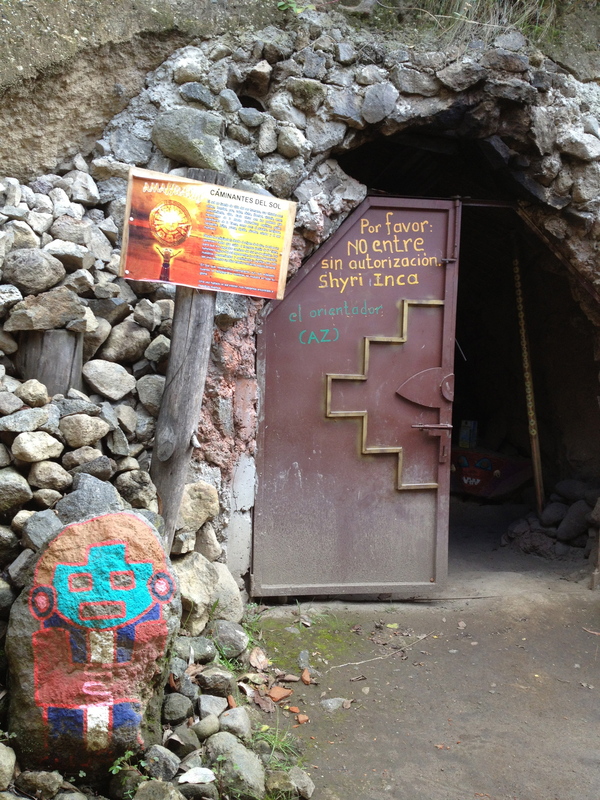 Accommodation was inexpensive in Ecuador. A private room in a hostel cost from $10-12. 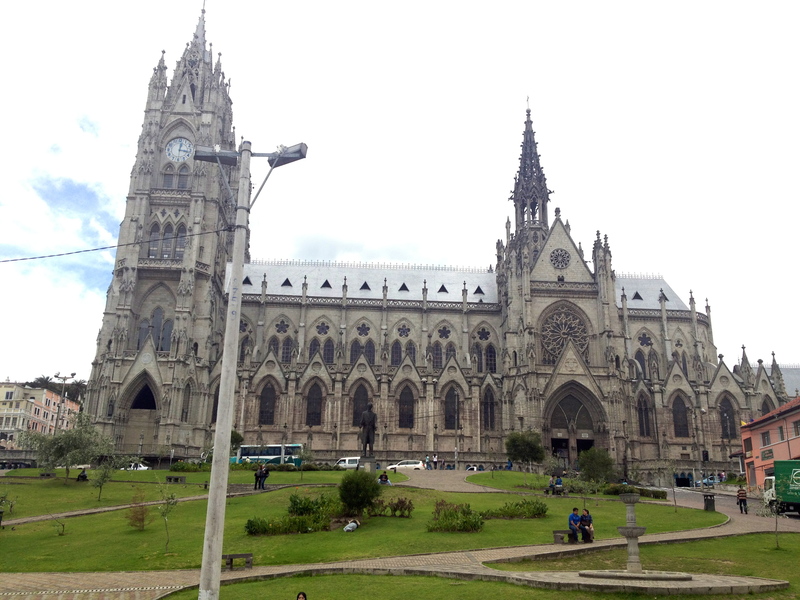 I traveled mostly by bus within Quito, which cost .25 USD. Taxis in Quito have meters and short trips generally don’t cost more than $3 or $4 USD. I prefered to buy food in the markets. Stuffing a ton of fresh fruits in my backpack and munching on them all day long was a great choice. You can also make your own food in the hostel kitchens and sharing them with other backpackers is a great way to socialize. 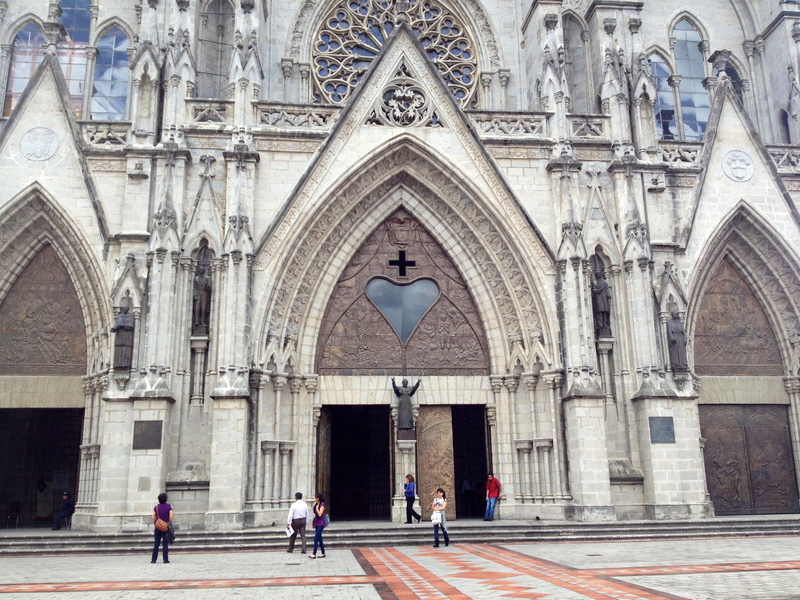 I was told that Quito was very unsafe for a solo female traveler, especially in the tourist areas such as El Centro Historico and La Mariscal. So, at nights, it is wise to take a taxi, even if it’s only three blocks. Since my hostel was right around the corner from a 24 hour lively area, and I went out for a quick “modern” dinner only one night along with other peeps, I didn’t encounter any problems. But again, I stuck to my ‘do not go out alone at nights’ strategy and stayed away from any unpleasant surprises. 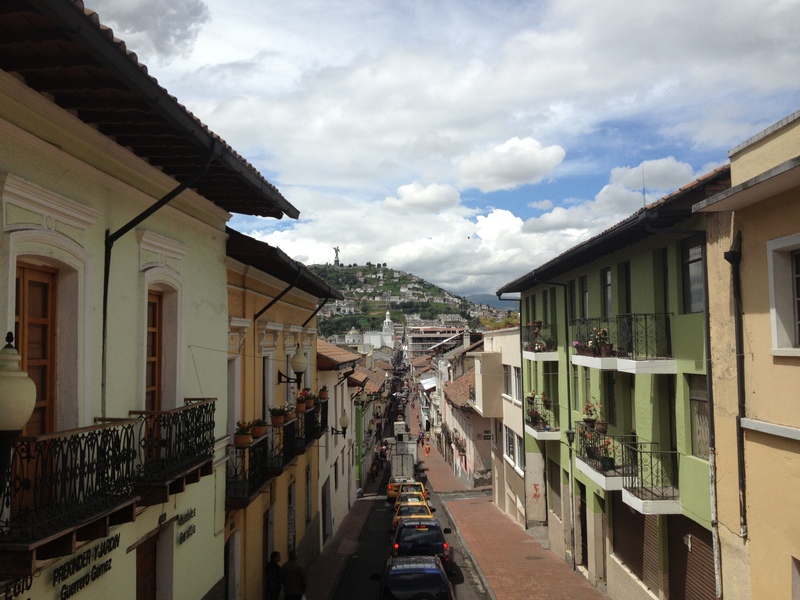 – Centro Histórico: To see the old town of Quito (and other parts of the town) I took a Hop and Hop off bus and rode on its roof deck all day, getting a nice tan, admiring the Spanish colonial architecture, and taking a ton of pictures. 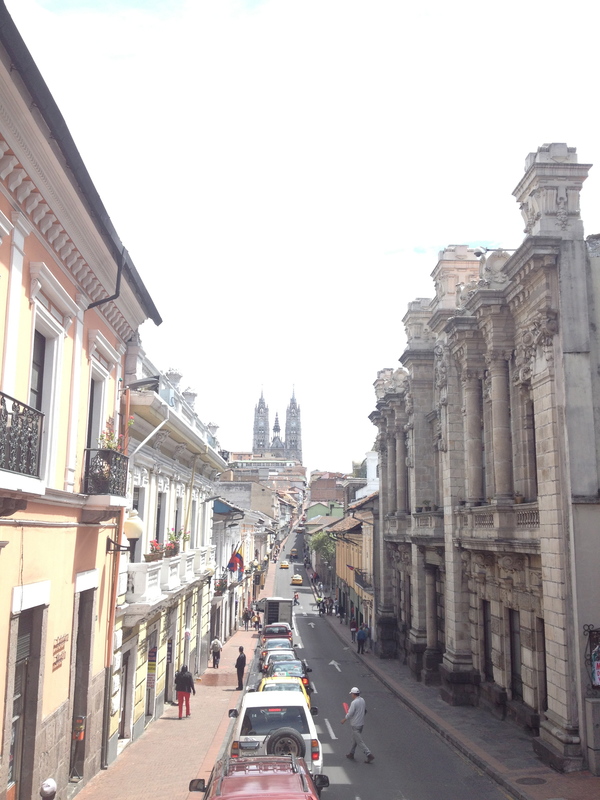 After the 3rd loop and at the end of their business hours, I had to get off and start to walk in the steep, narrow, historic streets of Quito. 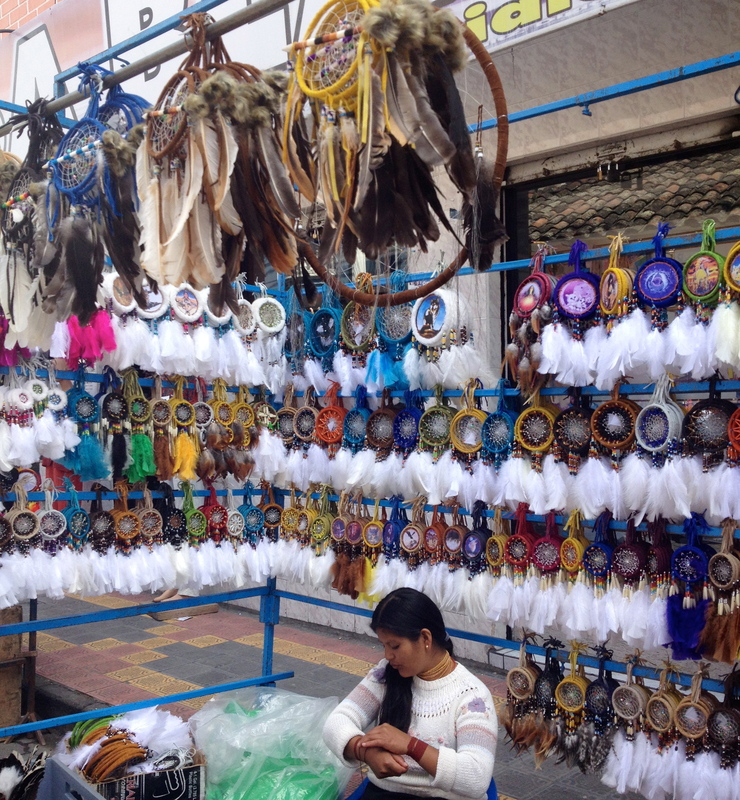 – Artesania Market: The handicraft market in La Mariscal which is a couple of blocks from la Plaza El Quinde. 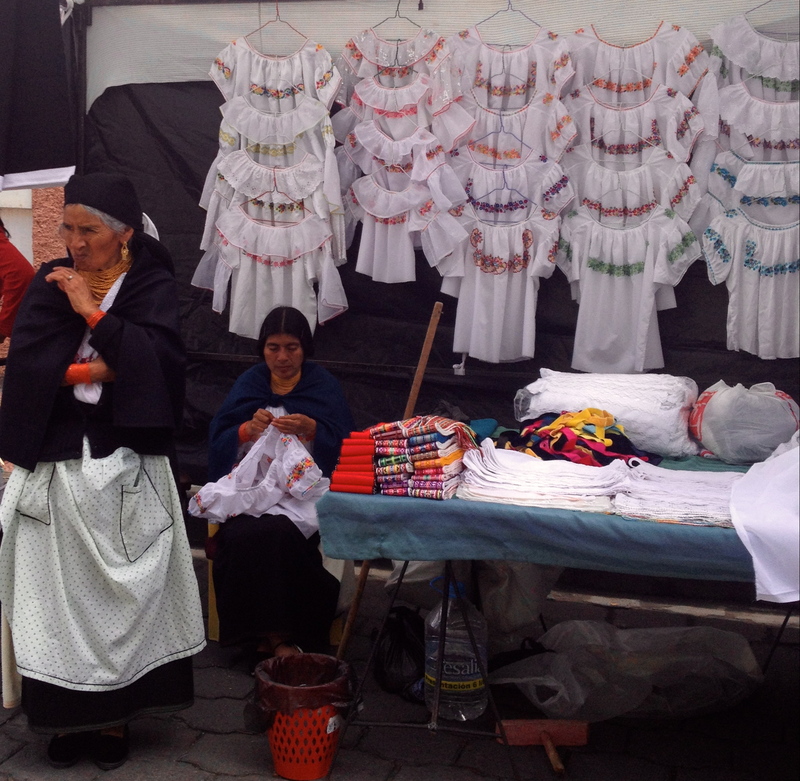 Unless for some reason you go to Otavalo Market, you can buy beautiful handmade authentic goods here from clothing to shoes to accessories. 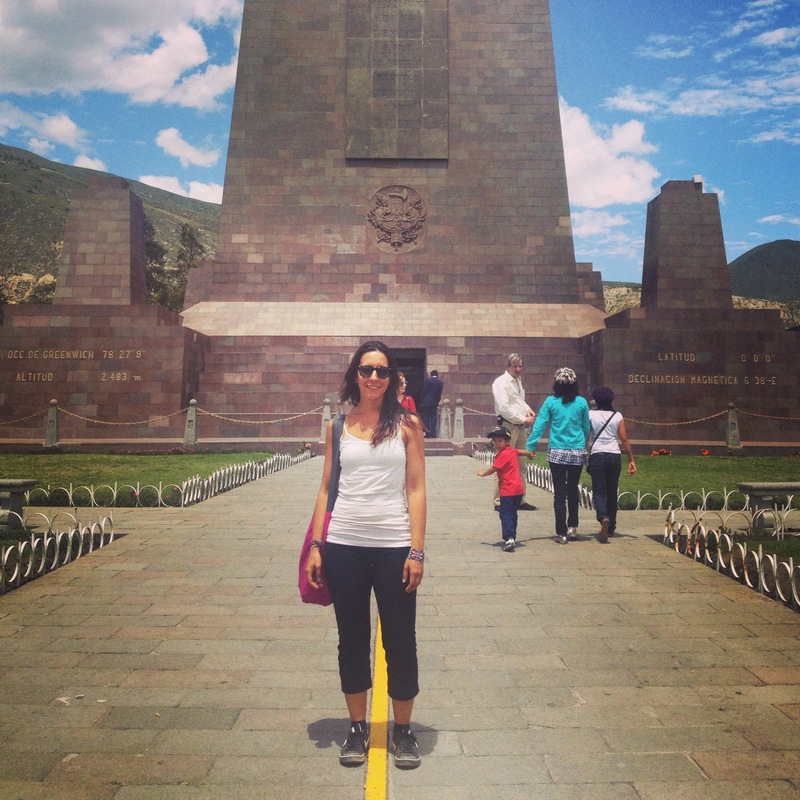 – La Mitad del Mundo aka Equator line: The bus ride takes forever and it’s a very touristy thing to do.. but how could I skip standing on the Equator line with one foot on the Northern and the other on Southern hemisphere? 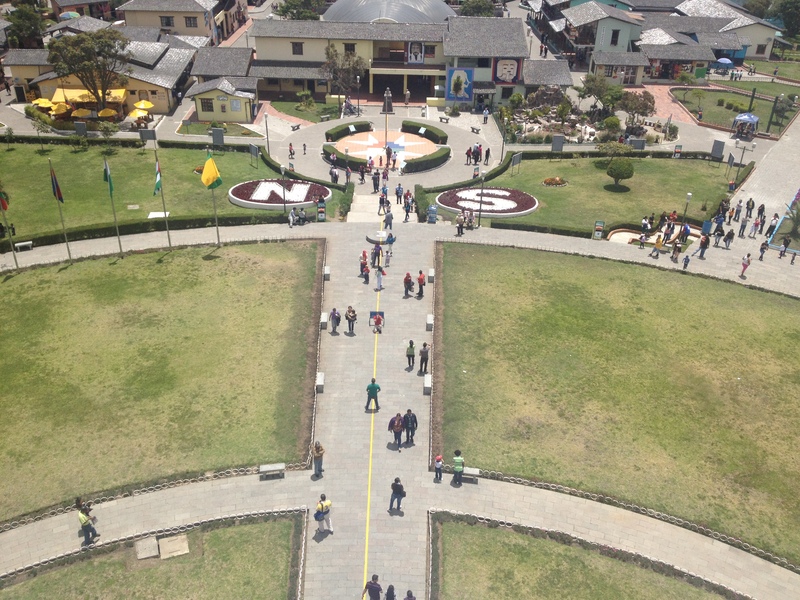 The real equator line lies only 240 meters (10 minute walk) from the celebrated monument of La Mitad del Mundo. The landscape still represents a small indigenous village, whom discovered the point over a hundred years ago, before GPS. 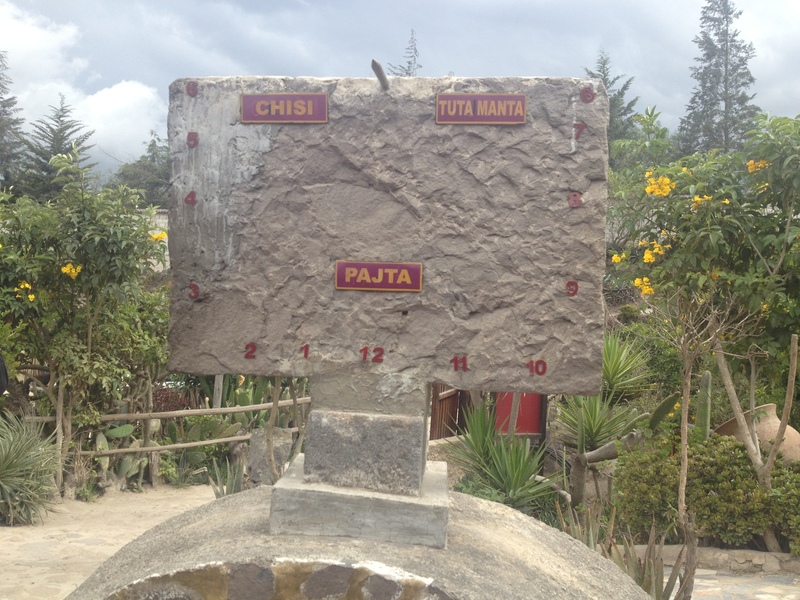 You can participate in fun experiments which can only be done on the real equator line. 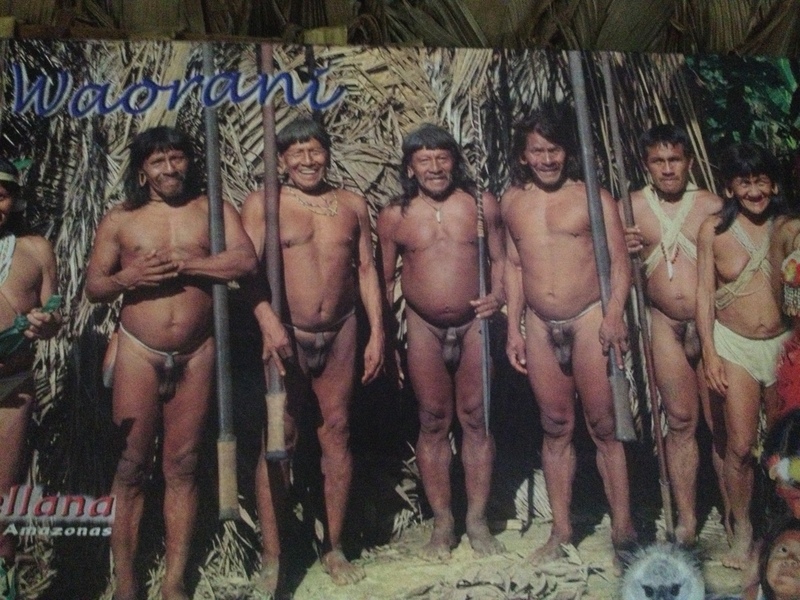 Attention to the penises tied to the bellies to get them out of the way while hunting/running. They look pretty comfortable. 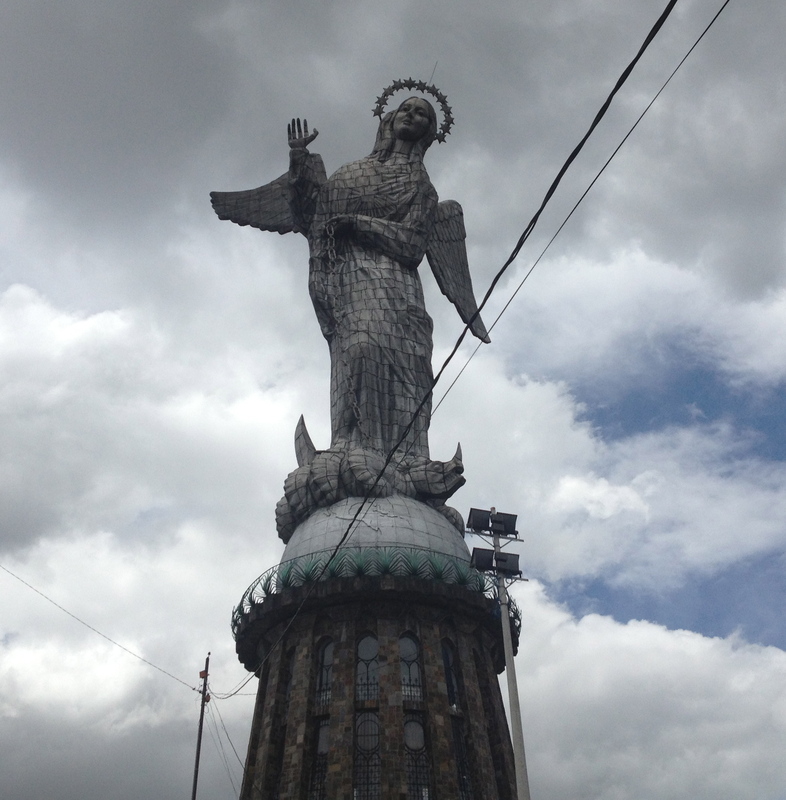 – Basilica del Voto National – the unfinished, glamourous, gigantic basilica. I passed by this several times on the roof of the hop on hop off bus and finally got off the bus to go inside in one of them. 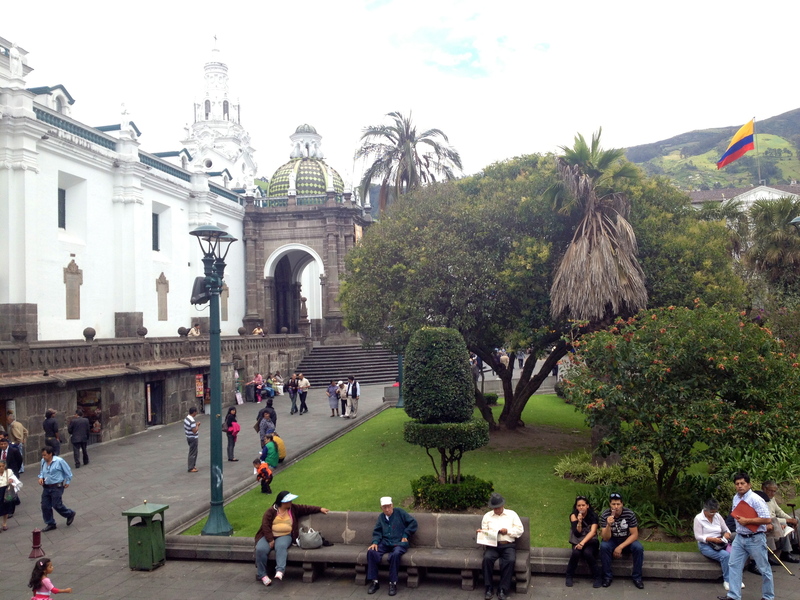 I then continued on foot to see La Plaza de La Independencia. 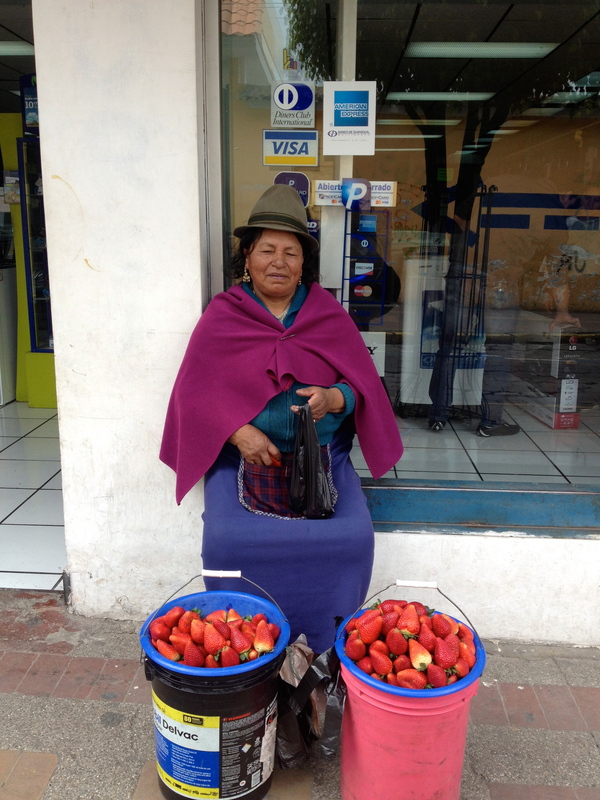 After staying one night in Quito, I made a reservation at Hostal Chasqui and headed to Otavalo early in the morning. 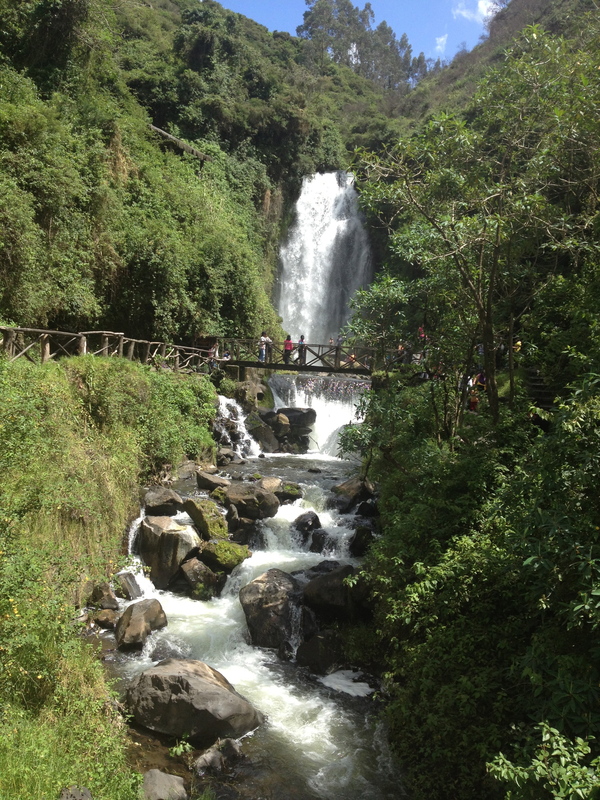 Otavalo is a town situated northwest of Quito. 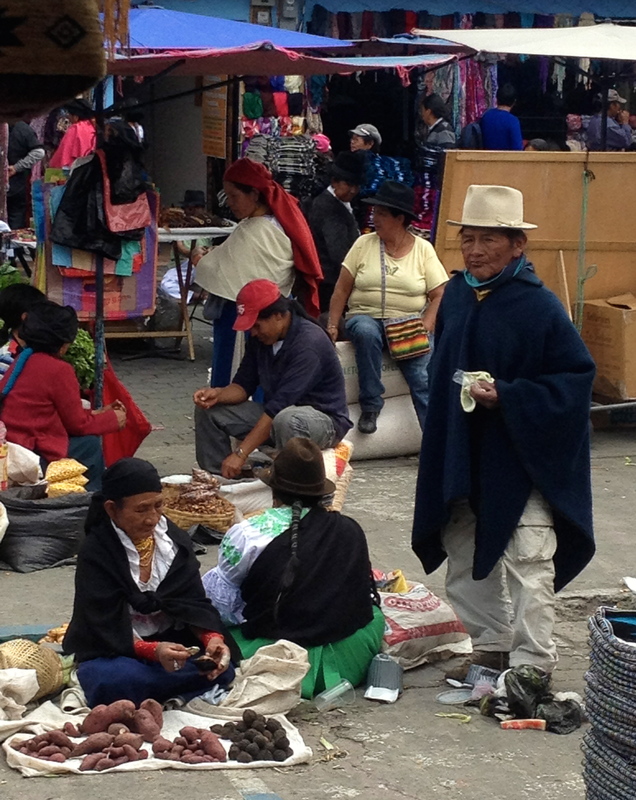 Its Saturday market is one of the largest in Ecuador and dates back to Inca times and it’s Ecuador’s most famous indigenous market. 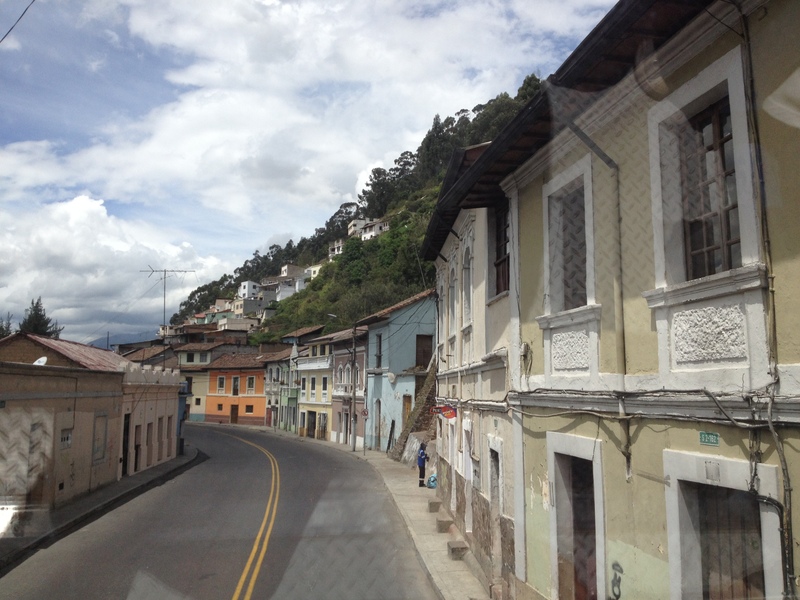 The 3-hr bus ride took me through the northern highlands of the Andes mountains, passing several small towns and lakes along the way. The hostel was very conveniently located and provided me my first private room after 6 weeks of traveling for a price of $10/night. Using the free washing machine on the roof as well as cooking in the roof kitchen overlooking the city were a bonus! 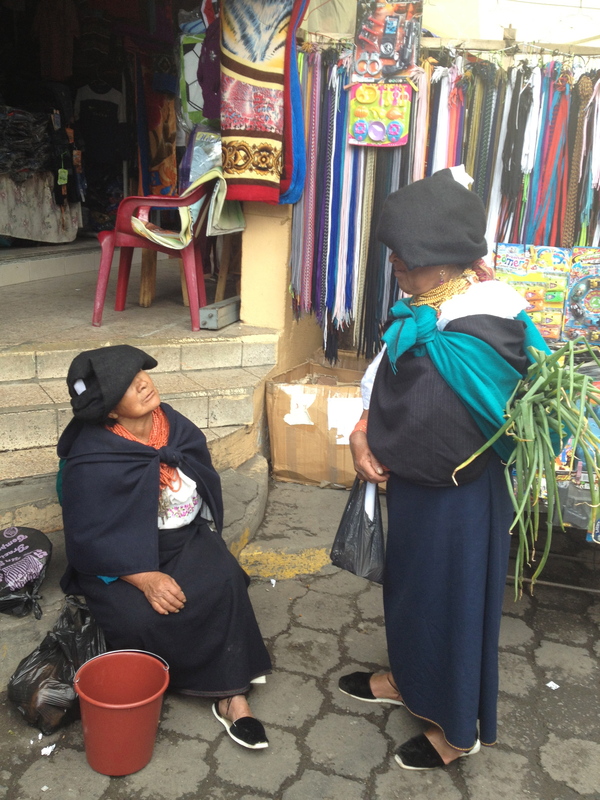 I got to Otavalo on Friday to explore the town and its surroundings before thousands of ppl flooded its streets for the Saturday market next morning. What was sold in the market? Handicrafts, jewellery, necklaces, musical instruments, clothing, home decorations, vegetables, almuerzos (lunch), and animals are just a few of the things you could buy at this expansive market. 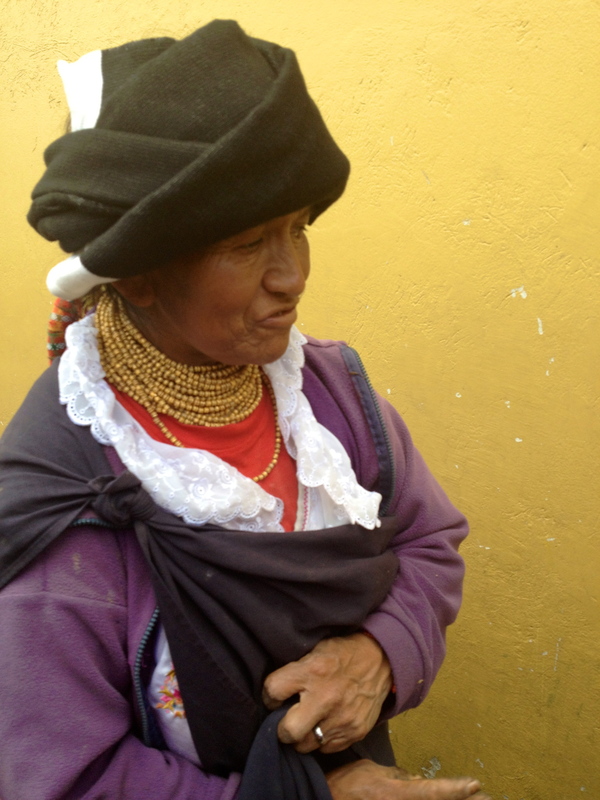 Both men and women were small and cute and mostly dressed in colorful traditional clothes. I loved everything I saw in this market! 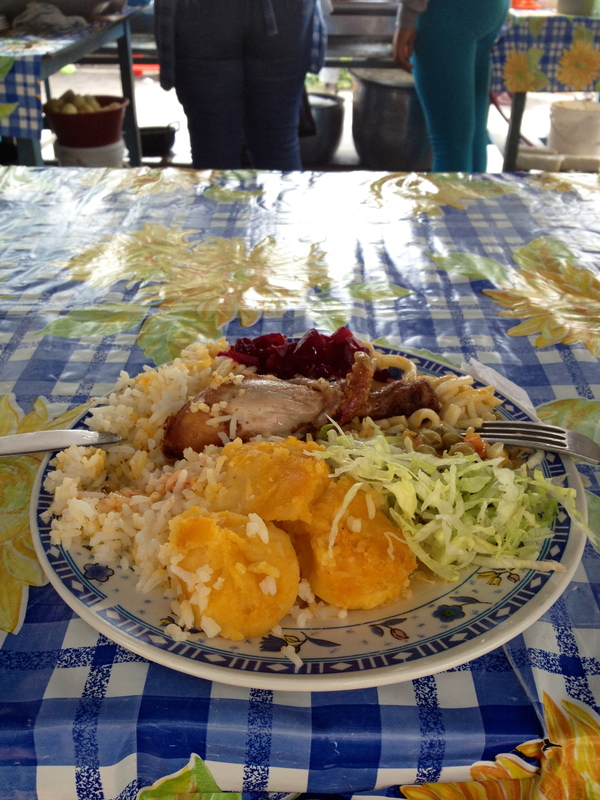 Almuerzo with chicken, rice, salad and vegetables for $1 USD! 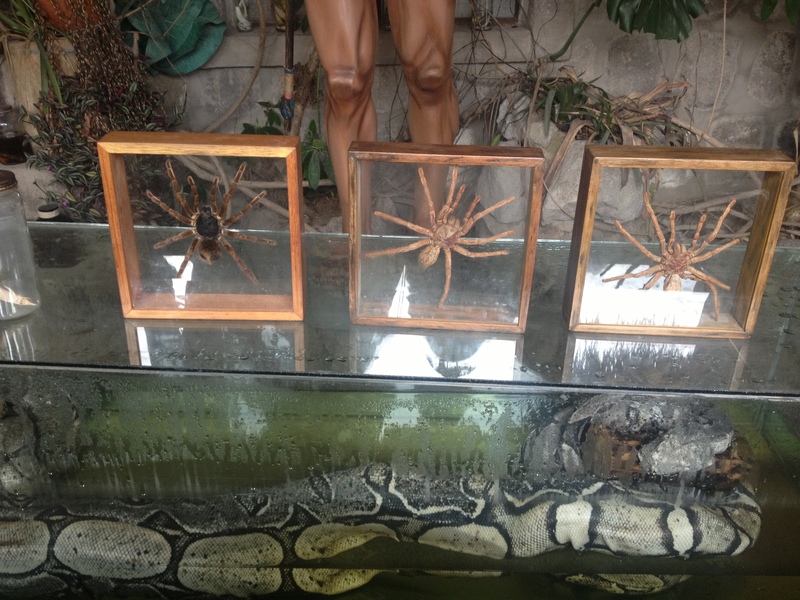 One of these dream catchers is hanging in my apartment in New York! 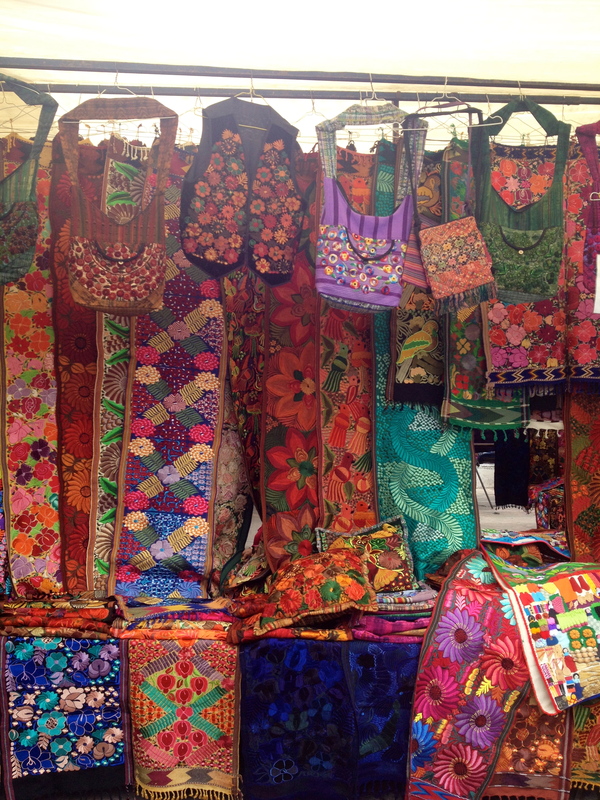 I wish I had more room in my backpack to buy some of these colorful fabrics. After the market quieted down in the afternoon, I took a 30-45 min hike to Las Cascadas de Peguche, which is a park that is the home to Peguche Waterfall that is considered as an Indigenous Ceremonial Site due to the purification baths held here a couple days prior the Inti Raymi celebration (Sun and harvest celebration, June 21st). 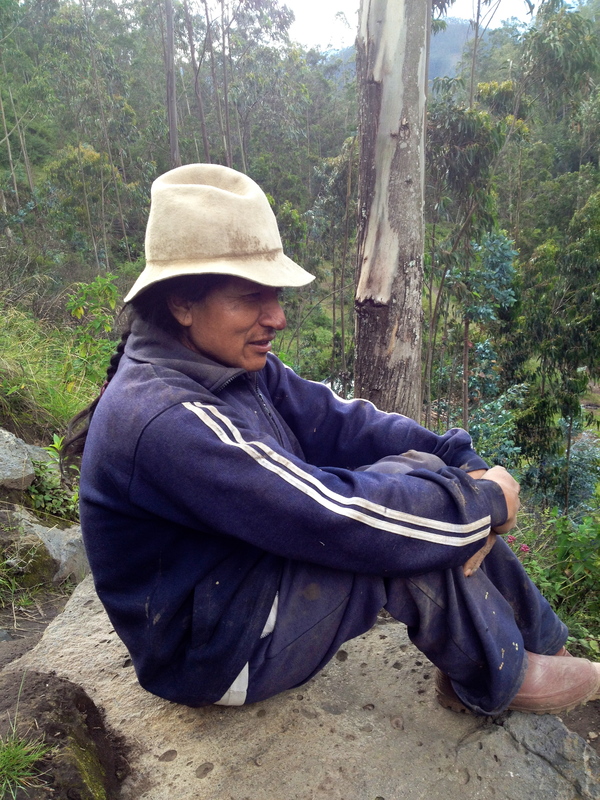 Shry Inca, German Patricio Lema whom I met during the hike. 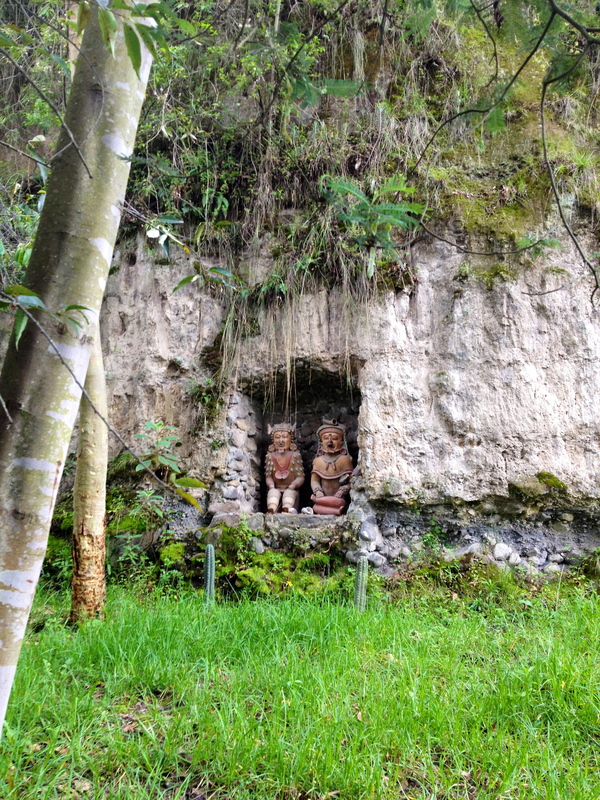 He is the keeper of the 2000 year old Inca cave in the park. 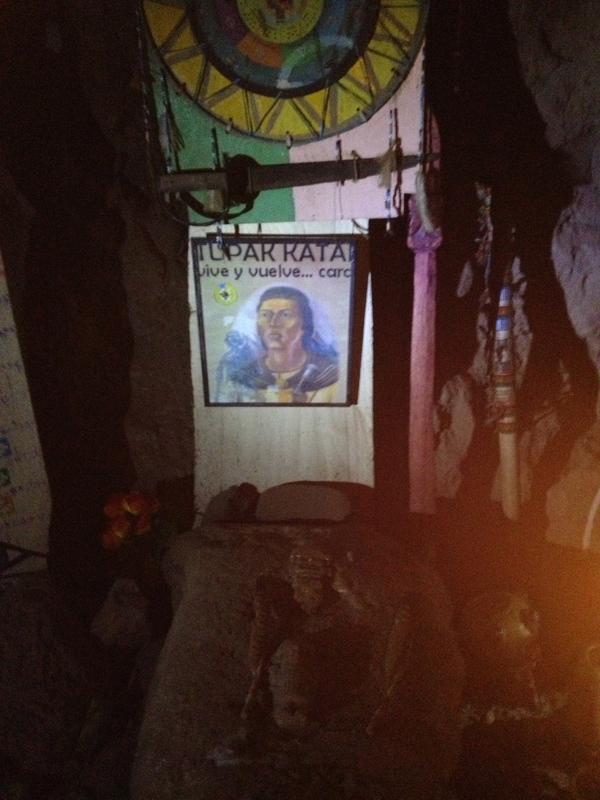 I visited him twice as he offered to teach me reading the Inca calendar. Unfortunately my Spanish wasn’t good enough to comprehend everything. But I still have the destiny cards and his book to learn from. 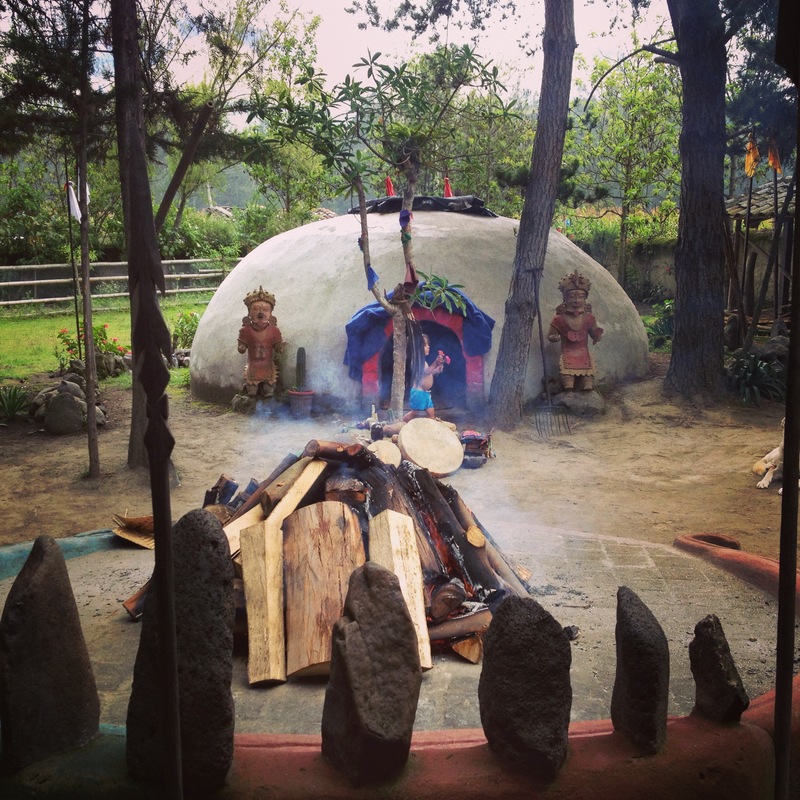 I also had a chance to join a Temazcal ceremony with a shaman named Geovanny who was kind enough to invite me to his home. We were about 8 people (a couple from Holland, 2 San Franciscans, me and 3 Ecuadorians who sang and played instruments beautifully during the ceremony). This 4 hr evening/night ceremony was a pretty powerful experience for me. 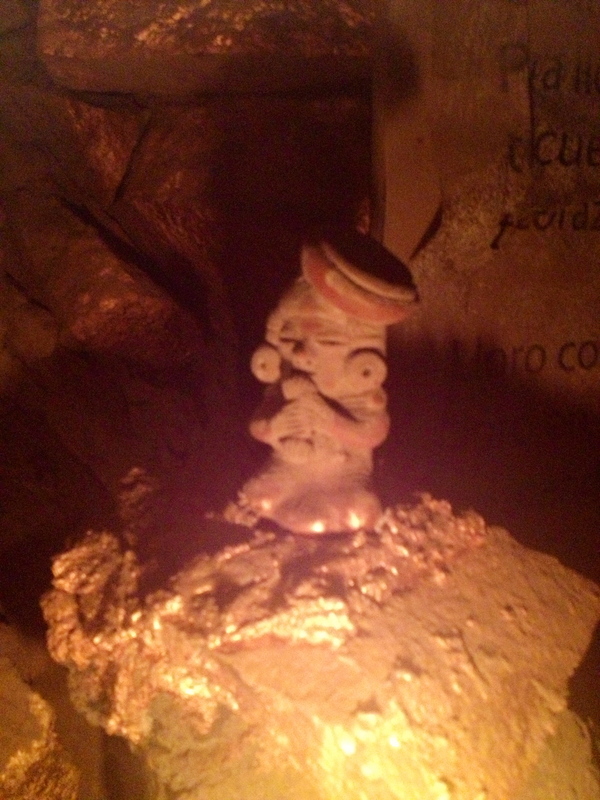 I am looking forward to seeing Geovanny once again in a medicine Temazcal, which includes drinking Ayahuasca. 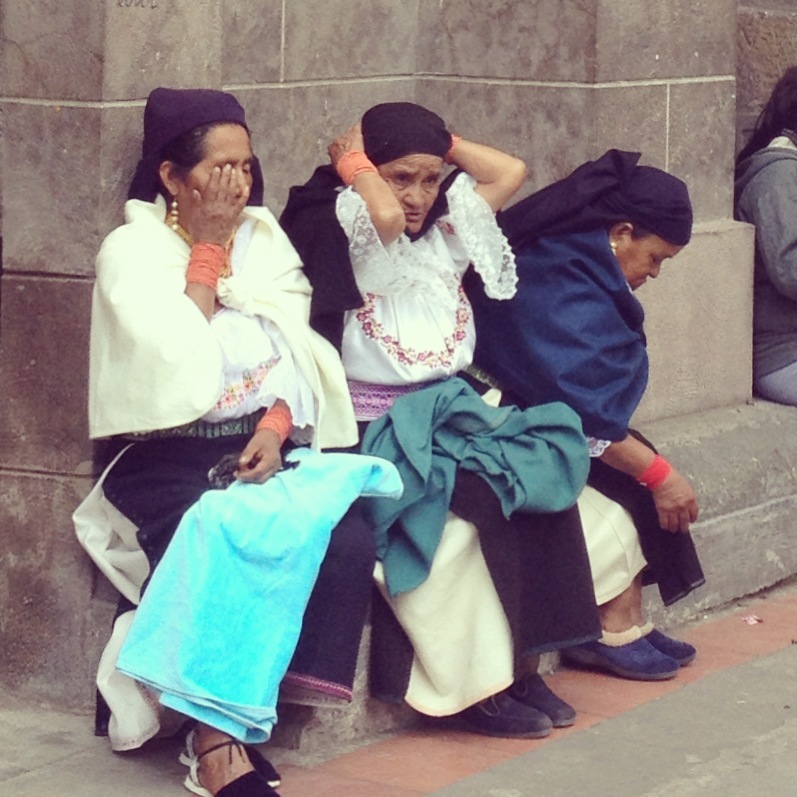 You can read more about my ayahuasca experience and where to find it here.